Хайнрих Фокке направил в середине 1920-х годов "Deutsche Versuchsanstalt fur Luftfahrt" (DVL) предложение о постройке необычного пассажирского самолета, спроектированного по схеме "утка". Постройке прототипа предшествовали продувки моделей в аэродинамической ДальшеMore>>> трубе в Гёттингене. F 19 Ente представлял собой высокоплан со свободнонесущим крылом, каркас фюзеляжа выполнен из стальных труб, обтянутых полотном. В фюзеляже размещены открытая кабина для двух летчиков и закрытая кабина для двух пассажиров. Вертикальное оперение установлено традиционно - в хвостовой части фюзеляжа, но горизонтальное оперение вынесено вперед и смонтировано на стойках над носовой частью фюзеляжа. Размах горизонтального оперения 5,20 м. Силовая установка включает два мотора Siemens Sh.11 мощностью по 75 л.с. Первый полет на F 19 Ente выполнил Георг Вульф 2 сентября 1927 года. Вульф погиб через 27 дней при демонстрации возможности полета на одном моторе, - лопнула тяга управления, после чего Ente сорвался в штопор. На втором прототипе установили моторы Sh.14, крыло уменьшенного размера с дополнительными вертикальными поверхностями. На втором прототипе в 1930 году первый полет выполнил Корнелиус Эдцард. The modern aeroplane, which has given rise to the revival of the subject of the tail-first arrangement, is the F.19, designed and built by the Focke-Wulf Company, of Bremen. Before proceeding to the actual construction of the machine, a model was very thoroughly tested in the wind tunnel at Gottingen, and an arrangement was evolved which proved perfectly stable around all three axes, i.e., longitudinally, laterally and directionally. Not until then was the work put hand, but the actual machine has now been finished and has passed its preliminary test flights, which appeared to bear out all the Gottingen results. That more searching tests may reveal certain vices in the machine is still a possibility, although at present there is no cause for believing that such will be the case. The wind tunnel tests indicated that the new machine cannot be stalled, and so far the full-scale appears to confirm this. The "Ente" (duck) had been ready for some time, but unfavourable weather delayed the first test flight until September 2. On that date, the machine was brought out, the two Siemens engines run up, and the machine prepared for flight. On this first test flight, the empty weight of the machine was 1,155 kgs. (2,530 lbs. ), and the flying weight 1,405 kgs. (3,090 lbs.). The angles of incidence of main plane and front plane, as well as the location of the centre of gravity, were carefully arranged to tally exactly with the Gottingen values. Herr Wulf took his seat in the machine, the chocks were removed and the engines opened out. The machine accelerated quickly, still maintaining its negative incidence. After a run of about 200 m., during which the controls were tested, the pilot pulled the control back, and the front wheel left the ground. Pulling very gently at first, and later a little stronger, the pilot soon had the machine in the air. Keeping it low to gain speed, he presently rose, gently at first, but later, as all seemed in order, more steeply, and before long the "Ente" was at 500 ft. Next a turn was attempted ; this also was perfectly normal, and increasing the turn to quite a short one, the pilot passed over his starting point at about 600 ft., waving his hands to show that the machine would fly itself. 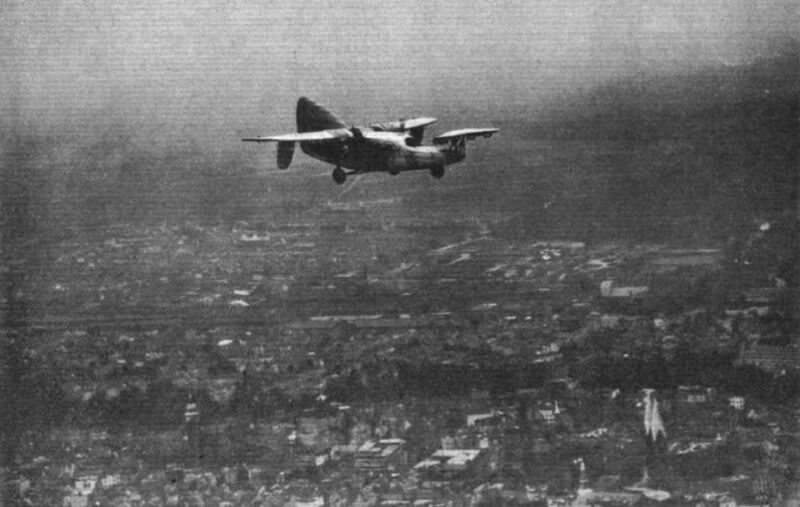 He then flew over the town and made several left and right-hand turns, some of which were carried out by tilting the front 'plane around its longitudinal axis. The landing also was made without a hitch, although, owing to a defect in the wheel brakes, the run before coming to a standstill was rather long. The airspeed indicator fitted was not above suspicion, but experts who watched the flight estimated the speed to be approximately 140 km./hour (87 m.p.h. ), which is about the designed speed. The pilot reported good stability around all three axes, and also that the control surfaces acted promptly and powerfully. In the matter of constructional features, the F. 19 follows closely the normal practice of the Focke-Wulf Aircraft Works. The fuselage is a ply-wood covered structure of the type used as standard by this firm, and structurally shows no difference from the fuselage of the types A. 16 and A. 16a, etc. Its shape is, of course, altered to conform to the new conditions. The monoplane wing is, both in its sections, plan form, etc., identical with that of the A. 16; the only difference is that certain small changes in angles of incidence (the wing is not uniform) have been made. The structure is an all-wood one, with box spars. The front wing or "tail" plane shows a pronounced taper in chord and thickness, and the elevator flaps are hinged to the fixed plane in a somewhat peculiar manner on large external cranks. It appears from the photographs that some form of aileron slot action is incorporated, but the exact nature of this cannot be ascertained. There is little doubt that a neater arrangement could easily be designed, and, doubtless, this will be done in later machines, this first "Ente" being purely an experimental type. The front plane is so mounted that it can be rocked laterally around a longitudinal axis. In this manner it is made to assist the rudder, and this feature is chiefly intended for use when one engine cuts out. The undercarriage consists of vertical telescopic legs attached at the top to the wing, and at the lower end to the apex of a vee formed by the axle and its radius rod. It would appear that the ground clearance of the fuselage is rather small, and possibly the incorporation of some form of "spring bottom" might be an advisable addition in a production type of machine, so that in case of undercarriage failure the fuselage itself would absorb a certain amount of shock. Under the forward portion of the fuselage is a third wheel, partly buried in the fuselage. As far as we know, this wheel is not made steerable, but there should be no difficulty in making it so, when the machine should be very easy to taxy about on the ground at speeds so low that the air rudder would have little effect. Wheel brakes are incorporated in the main wheels, and owing to the location of the third wheel well out in front, these can be applied without fear of turning the machine over. In fact, it would probably be next to impossible to turn the machine over on the ground. Two Siemens radial air-cooled engines of 75 h.p. each are mounted under the wing, in streamline cowlings. The two petrol tanks are built into the leading edge of the wings, one on each side, and fireproof bulkheads separate the engines from the wing structure. The location of the petrol tanks is such that direct gravity feed can be employed. As already stated, no performance figures are available, but the wind tunnel tests indicated that the efficiency of the "Ente" is about the same as that of a good modern commercial aeroplane of orthodox type. THE history of "canard" aeroplanes extends back to 1907, when Santos Dumont was the first pilot to carry out one or two short "hops" with this type of machine. About the same time Heinrich Focke, the present chief of the German Focke-Wulf Works, and his brother experimented with canard models and set up a theory of their working, leading to their applying for a patent, which was granted them in 1908. A machine was then constructed in the works of Dr. Rumpler, and equipped with a 40-h.p. engine. This machine carried out several short flights on a field near Berlin, in September, 1909, with Dr. Alberti at the controls. In the following year the Frenchman Voisin executed short flights with a similar plane, which was by him named “canard," meaning duck, this being derived from the peculiar aspect of the machine in the air looking like a flying duck. In 1911 the German Professor Reissner also carried through some promising attempts with a canard plane. Notwithstanding all these and many more less well-known attempts being relatively successful, none of these men succeeded in procuring the necessary financial support to enable them to continue work, for the now normal type of plane was quicker to mature to good performances. There is always a prejudice against taking up for development old ideas that already once had to be dropped for apparent impracticability. 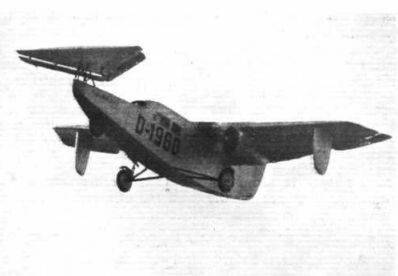 This is no less so in Germany than elsewhere, and the fact that in 1925 the German Aeronautical Research Institute (Deutsche Versuchsanstalt fur Luftfahrt), after very carefully considering proposals brought before it by Focke-Wulf, gave the latter makers an order for a canard plane was, therefore, something of a sensation. The internationally well-known scientists of this institute, funds of which are anything but abundant, must have seen a very promising future for this type of plane, or they would not have dared to invest considerable sums in its development. In fact, the plans met with the whole-hearted support, not only of this institute, but also of several technical colleges; for instance, at Goettingen, where the responsible men allowed the wind tunnel to be used for months on end, to the exclusion of all other important work, for investigations on the new canard plane. Also at Aachen (Aix-la-Chapelle) leading scientists offered and gave their full assistance. This lengthy introduction, I feel, is justified, for there are exceedingly few aircraft engineers anywhere that have ever given the possibilities of the "canard" plane any thought. Before describing the new plane, which has put up a most creditable performance, it may, therefore, be worth while just to mention the points in favour of the "canard" type plane. There are several main advantages inherent in the "canard" wing arrangement as compared with the usual wing arrangement now generally adopted. First of all, the "canard," plane cannot, under any circumstances, turn on its nose when landing, for the centre of gravity lies far away from the front end. This means greatly enhanced safety and fool-proofness, especially as it also admits of making full use of the wheel brakes when landing and thus cutting short considerably the landing run. Secondly, and much more important, is the fact that it is impossible to stall a "canard," plane, for the front wing of this has a considerably higher angle of incidence than the main wing. This means that the small front wing will reach the burbling point correspondingly sooner than the main wing. As then, however, the front part of the machine immediately ceases to rise, owing to the front wing ceasing to support it, the rear wing can never reach the burbling point. Thus one grave cause of accidents is entirely eliminated, especially if, as is the case with the present Focke-Wulf "Ente" a type of main wing is used that anyhow positively precludes any possibility of a spin developing, as has been definitely and conclusively proven. Thirdly, in the event of the machine hitting an obstacle on the ground, the passengers are comparatively safe from injury as the long fore-part of the machine protects them. This is all the more the case if, as in the present Focke-Wulf "Ente," two engines are employed, which are located right and left of the fuselage under the main wing, for if these drop out of their mountings in a crash, they cannot crush the passengers. A peculiar advantage attaching to bi-motored "canard" planes is that some of the power lost by the formation of air eddies behind the front wing can be regained by letting the propellers in front of the main wing turn in the opposite direction to the vortices of these eddies. The propeller blast will then become practically straight. By fitting the propellers behind the main wing, their blasts go straight out into the air without touching any part of the plane. 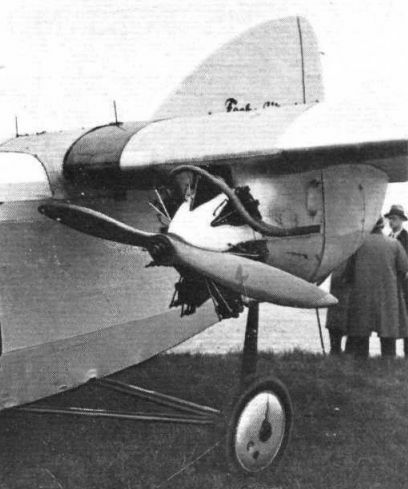 This arrangement has not been adopted in the present plane, as the makers did not consider the connecting shaft problem between engine and propeller sufficiently cleared up, and they did not want to enter into any new experiments. All these are advantages worth considering, and they make it intelligible why the German Aeronautical Research Institute attaches such importance to the new type of plane. 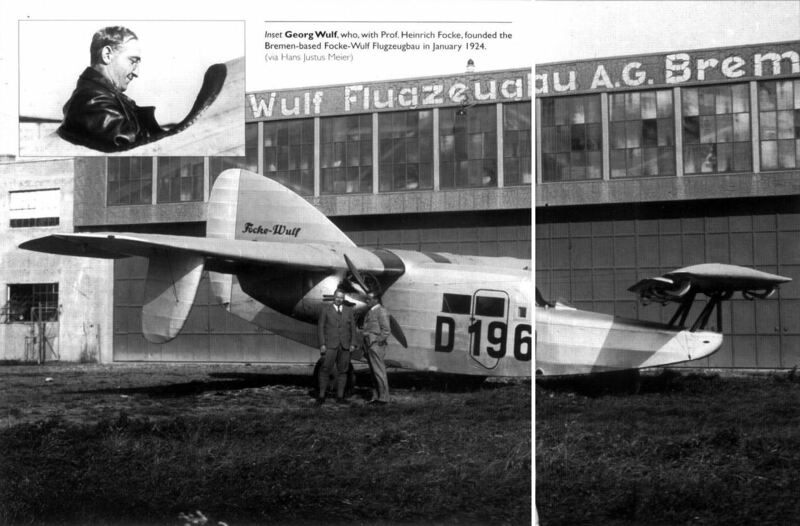 It will be recollected that the first Focke-Wulf canard plane was completed in 1927 and that several successful flights, in fact 14, were accomplished with it, before, on September 29 of that year, Herr Wulf, the associate of Hinrich Focke, crashed with the plane and lost his life. This accident, it must be pointed out, was discovered to be no result of any flaw in the "canard" principle, but was traced to a special kind of control of the front wing, which has now been dropped, and to which reference will be made later. 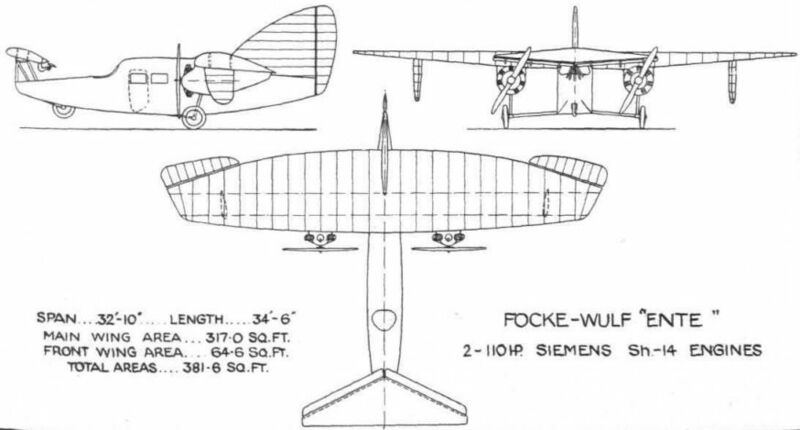 The new Focke-Wulf "Ente" has a total length of 34-5 ft., and the lower surface of the fuselage is square with a slight curve in the longitudinal direction making the ends come upwards. It is built up of welded steel tubes covered with fabric, and the main wing, which is of the peculiar Focke-Wulf type and has the ailerons in the normal position, is built up of wood, likewise fabric covered. It has a span of 33 ft. and a lifting surface of 317-5 sq. ft. It lies on top of the fuselage and is secured there in a recess, its leading edge being about 12 ft. away from the rear end of the fuselage. Left and right of the latter, fitted immediately under the wing, are engine nacelles carrying at their forward end each one Siemens & Halske radial engine of 100 h.p. output. Behind the engines, inside the nacelles, are fireproof bulkheads, and again behind these are the upper ends and the rubber ring shock absorbers of the telescopic legs. The wheels beneath the main wing are supported on divided axles. The engine nacelles also carry the oil tanks, whilst the fuel tanks are located in the wing nose, right and left of the fuselage. Immediately in front of the leading edge of the main wing begins the three-place passenger cabin, entered by a door on the right side. In front of the passenger cabin the top of the fuselage sweeps down embracing at this point the pilot's open cockpit. In front the fuselage ends in a blunt point, above which it carries trestle struts, which support the front wing. The latter has a span of 16-4 ft. and a lifting surface of 64-6 ft. It is trapezoidal, or almost triangular in shape, with a straight and long leading edge. The trailing edges meet at an obtuse angle, and their under surfaces are recessed for the elevators. These are compensated and supported by a number of brackets holding them so that there is a slot between them and the wing, which slot becomes narrower when the elevators are depressed for climbing, and larger when they are raised for going clown. The trailing edges of the elevators are formed by a strip of aluminium, 1/8-in. in thickness, and standing out rearwards for approximately 1 in. In the earlier model, which, as previously mentioned, crashed in 1927, the front wing was so mounted that it could be moved see-saw fashion on its support, from the pilot's cockpit. This arrangement was adopted, as it was hoped to counteract, by moving it one way or the other, the effects of one of the engines ceasing to work in mid air. Now, however, the wing is held in a horizontal position by double cables at each side, while horizontal stresses are, to a certain extent, taken up by the wing tips being connected by cables with the tips of the main wing. Underneath the front wing, recessed in the fuselage, is a third wheel. Owing to the turning point of the 'plane lying so far back in front of the main wing, it was necessary to provide a very large rudder fin, to which is then attached a narrow and high rudder. There appear to have been difficulties to ensure the 'plane keeping on its course, for in addition to the rudder fin, two further fins, of relatively large size, have been provided, one each side left and right underneath the main wing, about half way between the engine nacelles and the wing tips. These vertical fins are supported on both sides by cables, and they are set at a slight angle to the axis of the fuselage in such a manner that, if their 'planes were to be prolonged in a forward direction, they would meet some distance in front of the 'plane. All controls are operated by wire cables running over pulleys. The weight of the complete 'plane, including the passenger appointments, is 2,585 lb., and it is capable of transporting a load of 1,045 lb., making a total flying weight of 3,630 lb. The maximum speed attainable is 88-5 m.p.h., whilst the cruising speed is 79 m.p.h., and the landing speed 51-5 m.p.h. The 'plane climbs to 1,000 m. (3,280 ft.) within 8 1/2 min. These performances are not very exceptional but in a 'plane so young of development, they must be regarded as very good. As a matter of fact, most of the development has been done in the wind tunnel and in the drawing office, and the makers were pleasantly surprised to find the machine behaving so excellently as already to admit of its introduction in the passenger transport business. The writer has enjoyed a ride in the machine, and was struck with the relative noiselessness in the cabin and the fine manoeuvrability in the air. The makers say that they have gained so much experience in constructing this 'plane that they now feel capable of building any size "Ente" 'plane from a small sporting to the largest transport 'plane. SOME COMMENTS ON THE FOCKE-WULF "ENTE"
WHEN trying to form an opinion of the merits or otherwise of the Focke-Wulf "Ente," one should bear in mind that, although it has now been approved by the German authorities for passenger-carrying, the machine is to be regarded as an experimental type, and it is to be assumed that improvements can be made in later machines. This supposition is necessary in order not to be unfair by being too critical, as one might well otherwise be. The designers do not claim for the "Ente" type either better aerodynamic efficiency or more economical structure weight, what they do claim is a number of advantages not possessed by the orthodox type of aircraft, such as impossibility of stalling and consequent spinning, and virtual impossibility of turning over on the ground, even when landing on very rough ground, or with the wheels locked by the brakes. Both these claims would appear to be supported not only by theory but by the very thorough flying tests carried out before the machine was approved for passenger-carrying. Thus the points in favour of the "tail-first" type of aircraft may be summed up briefly as follows: It will not stall, in the sense that its main lifting surface cannot, by any manoeuvre possible to the pilot, be made to exceed its maximum lifting angle. It will not spin, because before this is possible the main wing must reach stalling angle, which it never does. It cannot turn over on the ground. This is, of course, an obvious result of the length of fuselage projecting ahead of the centre of gravity and of the wheels. One point upon which we have no data is the loss of height incurred when the front lifting surface is stalled and the nose drops. A certain loss of height there must, presumably, be, but it would seem likely to be a good deal smaller than that which would result from a stalling of the main lifting surface. Apart from the actual loss of height, the worst case would, one presumes, be that in which the front lifting surface was stalled at such a height above the ground that the machine struck while at its steepest angle, i.e., just as the nose had dropped, and before it had had time to rise again as a result of increased speed gained in the dive. Much seems to depend upon that angle. If it is very great, serious damage might result from striking the ground. If the angle is not very great, or in other words, if the nose does not, at the maximum angle attained, point downward very steeply, then it seems likely that, even in this worst case, the machine might simply glide on to the ground without damaging itself. Turning to the other side of the balance sheet, it is not at all difficult to find room for criticism. For example, an examination of the figures reveals the fact that the ratio of gross weight to tare weight is only 1-405, a figure which can only be described as poor. A ratio of gross to tare weight of 1-6 or more is reached in most British aircraft, and that with loadings (wing and power) lower than those of the Focke-Wulf "Ente." One British machine which is comparable with the "Ente" in that it is of approximately the same weight, power and wing area, is the Saro "Cutty Sark." 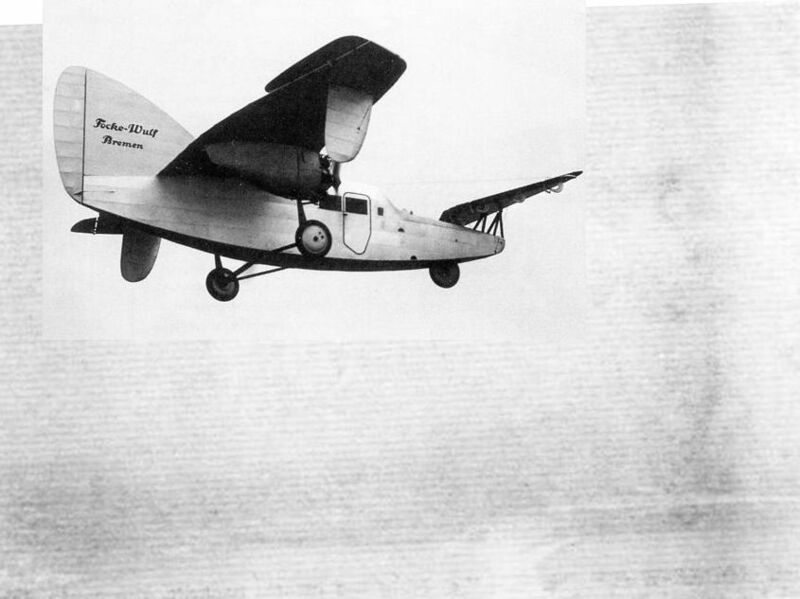 This machine, as our readers will know, is a flying-boat, also produced as an amphibian. In its plain flying-boat form the Saro "Cutty Sark" weighs fully loaded 3,700 lb., and the tare weight is 2,425 lb., giving a ratio of 1-522 as compared with 1-405 for the "Ente." The difference in gross weight is but 70 lb., but the difference in tare weight is 160 lb., both figures being in favour of the "Cutty Sark." The wing areas of the two machines are approximately equal, and the engines are also of approximately the same power. On the subject of aerodynamic efficiency, the "Ente" cannot be described otherwise than as disappointing. 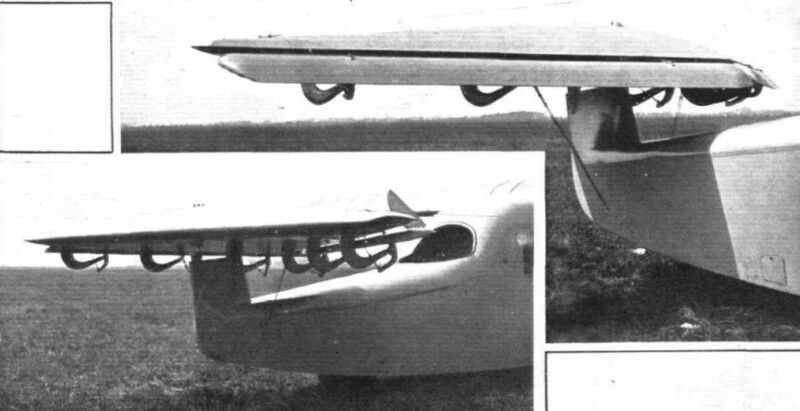 With a wing loading of 9-77 lb./sq. ft. and a power loading of 16-5 lb./h.p., the maximum speed given is only 88 m.p.h. With approximately similar loadings, the Saro "Cutty Sark" has a maximum speed of 105 m.p.h. It is a little difficult to account for this disappointing performance. The Everling "High-Speed Figure" is only 8-04 which is extremely low. The corresponding figure for the "Cutty Sark" is 11. Thus, assuming equal propeller efficiency, the minimum drag coefficient of the "Ente" is 1-375 times as great as that of the "Cutty Sark." There is no very obvious explanation of this. The "Ente" looks fairly "clean," although the "whiskers," in the form of large clumsy cranks, on the forward plane might produce a certain amount of unnecessary drag, as probably does also the fuselage flying "wrong end on." AS it was illustrated and described in detail in FLIGHT of January 2, 1931, there is little need to enter into a discussion here of the features of the Focke-Wulf "Ente" or "tail-first" machine which is at present visiting England. It will suffice if we recall that the idea underlying the design is a wing arrangement which precludes spinning, because the small leading plane is so designed, placed and loaded that it will stall before the main wing, thereby bringing the nose of the machine down and preventing the main wing from reaching stalling angle. The forward wing is of triangular plan form, and the elevator is so hinged to it as to leave a slot between them. This slot is not of the Handley Page type, which varies in size in accordance with triangular setting of the flaps, but remains sensibly constant in size, no matter at what angle the elevators are placed. We had the opportunity on Saturday last of making a flight in the "Ente," with Herr Cornelius H. Edzard as pilot, and a few impressions of the flight may be of interest. The tiny cabin has seats for two passengers, side by side, and in the forward wall, near the starboard side, there is a small window communicating with the pilot's cockpit. On this occasion we had hoped to be in the right-hand seat so as to be able to watch the control movements made by Herr Edzard during the various manoeuvres. Unfortunately this was not possible, and so the impressions of the flight are not nearly as conclusive as they might otherwise have been. As in other cabin machines, one's view forward is not very good, neither is it possible to see the ailerons and so get an idea of the amount of lateral control used. The engines cut off the view. The take-off is somewhat emotioning, as the machine climbs in a rather alarming attitude, although the actual flight path followed by the machine is probably not very much above normal. 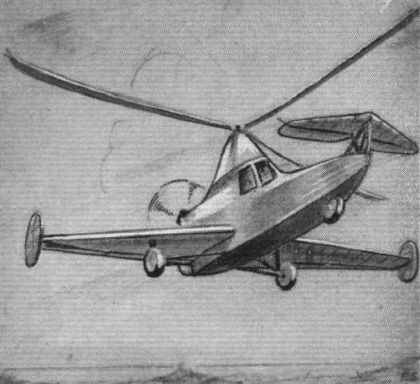 In flight the machine behaves exactly as does any orthodox aircraft, and is capable of all the normal manoeuvres, such as steeply-banked turns. We believe the machine has never been looped, but there is no reason why it should not be capable of looping. The landing appears to be just what the pilot likes to make it. When the machine is brought in at low speed, i.e., with the nose well up, it is a little strange at first to feel the nose drop suddenly when the main wheels have touched and the pilot applies his wheel brakes. The one demonstration which we wished to see was not given. This consisted in throttling the engines and gradually pulling the machine up until, at a speed corresponding approximately to the minimum flying speed of the forward wing, the nose dropped. We should very much like to see what sort of attitude the machine then assumes. If it is very steep, the "Ente” is in the position of the normal aircraft which stalls near the ground but does not spin. If the attitude is not very steep, the machine should have a good chance of gliding on to the ground without doing very much damage. На закате карьеры второй F 19 получил гражданскую регистрацию и закончил свою летную жизнь в качестве лаборатории на базе DVL в Берлине-Адлерсхофе. Самолет летал до 1939 года с регистрацией D-1960. 29 декабря 1927г. : Георг Вульф, один из основателей компании "Focke-Wulf", погиб, выполняя публичный демонстрационный полет на своем перспективном самолете схемы "бесхвостка" ("утка") - Focke-Wulf Fw 19. "TAIL FIRST": In this view of the Focke-Wulf "Ente" in flight can be seen the undercarriage, the outboard fins, and the very large fin and rudder. Выполнивший первый полет в конце 1930 года, второй F 19 выставили в музее "Deutsche Luftfahrtsammlung" в районе Берлин-Моабит. Самолет был уничтожен в 1944 году налетом авиации союзников. AN INTERESTING EXPERIMENT: The Focke-Wulf Co. of Bremen recently completed a second "Ente" or "tail-first" machine, which has now passed its type tests and is said to fulfil all the claims made for it. With the tail first arrangement the machine is made proof against stalling and spinning, while the general arrangement is such that the machine cannot be turned over on the ground, so that the wheel brakes may be applied with full force. COMING OR GOING? : The "Ente" in flight. Note the plan form of the front plane. AN OLD IDEA REVIVED: The view of the Focke-Wulf "Ente" during its visit to Hanworth. In the photograph the machine is climbing, but not nearly as steeply as it did on some occasions. 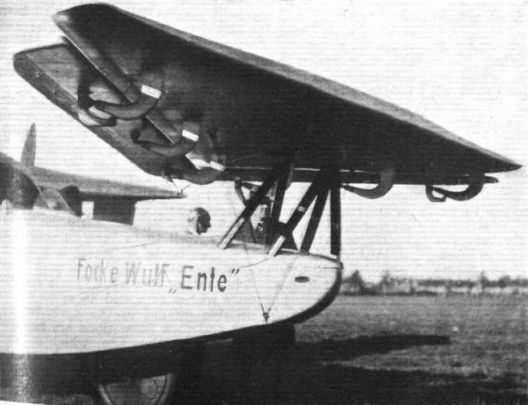 THE FOCKE-WULF "ENTE": Three-quarter front view. Note the negative angle of incidence when the front wheel is on the ground. THE FOCKE-WULF "ENTE": Three-quarter rear view. To get the side areas correct, a very large fin is necessary. A NEW FOCKE-WULF "ENTE": The latest model, flown for the first time the other day, resembles the previous machine, but the addition of outboard wing rudders will be noted. The Focke-Wulf F 19A Ente, D 1960, seen here shortly after completion in 1930 with, on the left, Prof. Heinrich Focke and company chief pilot Edzard. Often during this period, such things as the A suffix to the design number inferred nothing more drastic than some slight modification, or engine upgrade to the same machine. Not so in the case of the F19, where the A actually signifies radical, if not immediately obvious changes to the aircraft - a point lost on a number of latter-day commentators, who are clearly unaware of the existence of the first F19. First flown on 2 September 1927, the FI9 canard was aimed at the still embryonic air taxi/feederliner market and, as such, carried a pilot and up to three passengers. Powered by two 75hp Siemens Halske Sh II radials, the F19 cruised at 80mph and incorporated one quite novel purported safety feature that was to lead to the death of Georg Wulf, Director, Chief Pilot and co-founder of the company. Included within the parasol mounted foreplane of the F19 was a pivoting mechanism that allowed the foreplane to tilt side-to-side. The purpose of this tilting foreplane, according to the patent held by Prof. Focke, was to ease pilot control problems in the case of losing an engine. According to one knowledgeable source at the time, this tilting device had one drawback, it did not work in one particular set of circumstances. Apparently aware of this flaw, Georg Wulf, who had thoroughly tested the F19 over the past three weeks, took it aloft for a demonstration flight in front of potential buyers on 29 September 1927. During the course of this demonstration, made at low level, Wulf encountered whatever the problem was and although he nearly retrieved flying speed and control, the machine struck the ground killing him. The second machine, the F19A could be readily differentiated from the first by its underwing fins. Not so immediately apparent was the absence of the tilting mechanism from the now fixed foreplane. Thus modified, the sole F19A was to continue flying throughout the 1930s, ultimately retiring in 1939. 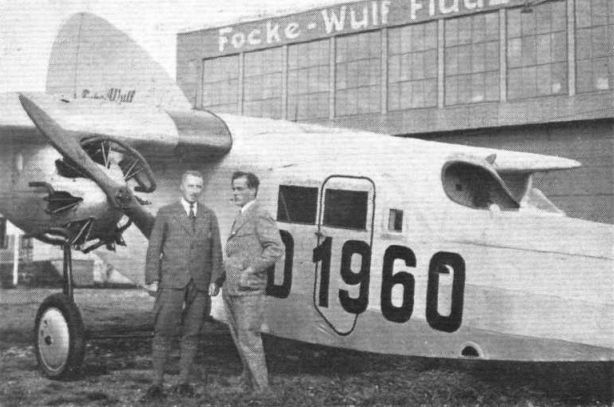 Inset Georg Wulf, who, with Prof. Heinrich Focke, founded the Bremen-based Focke-Wulf Flugzeugbau in January 1924. THE FOCKE-WULF "ENTE": Note the pilot's cockpit, the cabin door, and the petrol tanks in the wing. Standing by the machine are Herr Focke and the firm's chief test pilot, Herr Edzard. THE FOCKE-WULF "ENTE": Three-quarter front view. THREE RECENT FOCKE-WULF TRANSPORT PLANES: The A.32 "Bussard" six-passenger cabin monoplane (280 h.p. 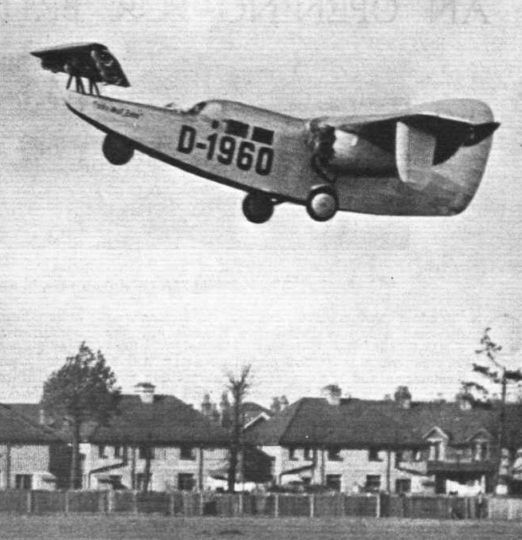 Junkers "L-5"), the A.33 "Sperber" for three passengers (145-h.p. Walter "Mars"), and the F.19a "Ente," the interesting "tail-first" machine. 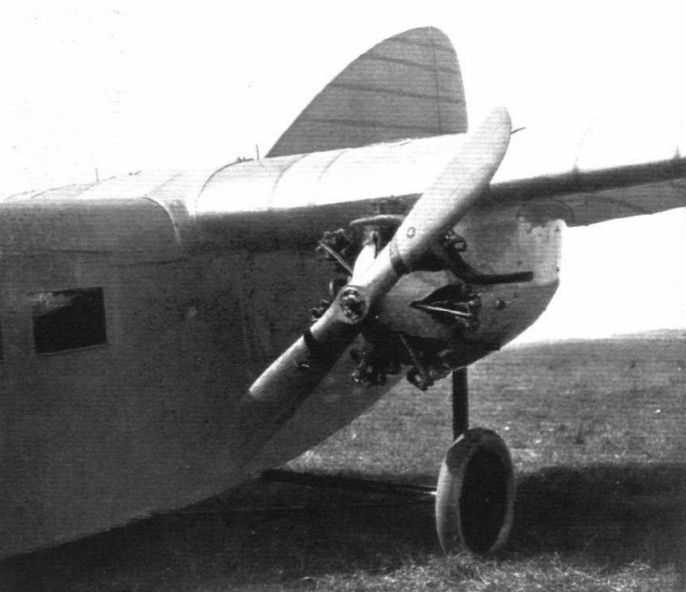 The Focke-Wulf "Ente": View of the port engine and undercarriage. Note also the petrol tanks in the leading edge. One of the Power Plants of the "Ente": These are Siemens Sh-14 type, of 110 h.p. each. The undercarriage consists of a horizontal Vee and a telescopic strut to the engine mounting. THE FOCKE-WULF "ENTE": Two views of the front wing. Note that the elevator is so hinged as to give a slot action. THE FOCKE-WULF "ENTE": Two views of the front plane. Note the slot arrangement of the elevator flaps.